GOOD NEWS, MSPs. This managed services thing just might be catching on. Sounds like old news, right? Vendors, analysts, and industry experts have been talking up managed services since well before ChannelPro’s 2007 debut, and break-fix providers have been embracing the recurring revenue business model in growing numbers for nearly as long. Yet hard as it is to believe, this year’s ChannelPro State of the Channel study is the first ever in which a higher proportion of participants offer managed services (65 percent) than break-fix services (59 percent). And while the managed services market has been a fixture on the channel landscape for what feels like forever to many of us, further data from our research makes clear that there’s room for additional growth—lots of it, in fact. Just 27 percent of participants in our 2019 survey make half or more of their revenue from managed services, and 57 percent expect managed services to account for a greater share of their revenue this year. Far from being yesterday’s news, the managed services story is just getting started. “There are undeniably more managed services customers out there than there are qualified manage service providers,” says Charles Weaver, CEO of membership organization MSPAlliance. Managed services isn’t the only supposedly mature market with plenty of growth potential either. Our latest research suggests there’s both accelerating adoption and continued opportunity ahead in other much-discussed markets as well, including cloud computing, security, and the still-nascent Internet of Things (IoT). THOUGH IT FEELS LIKE MSPs are yesterday’s news, this is the first year more respondents offer managed services than break-fix. MANAGED ENDPOINT and network providers are adding more as-a-service offerings and venturing into fields like telco and print. LARGE PORTIONS OF THE CHANNEL offer cloud solutions, but much smaller numbers are making serious money from them. MOMENTUM FOR THE INTERNET OF THINGS is building fast, as is demand for security services. It’s no great mystery why managed services remains an up-and-comer among channel pros. It pays better than pretty much anything else they do. Indeed, nearly 35 percent of respondents to this year’s poll say managed services deliver high margins. By contrast, none of the 34 other offerings we asked about is deemed a high-margin business by even 30 percent of survey participants, and only about 20 percent of channel pros say break-fix offers high margins. Moreover, MSPs are buoyant about the future as well. Just under 49 percent of them expect profits on managed services to improve this year, according to our data. Once again, nothing else on the extensive list of offerings we inquired about even comes close to that high-water mark. And it’s not just channel pros who are bullish on managed services. Gartner, which expects global IT spending to increase 3 percent this year to $3.8 trillion, predicts that IT service outlays will outpace that growth, rising nearly 5 percent to a little more than $1 trillion. That may be why approximately 57 percent of the people ChannelPro surveyed say that offering managed services versus break-fix alone has a positive effect on competitive advantage. Christopher Peters, owner of I Divide By Zero Technical Services, an MSP and integrator in Arlington Heights, Ill., is among them. Business owners like knowing there’s someone continually working to keep the devices and services they count on up and running. That logic has SMBs paying for more and more technology on an as-a-service basis, and MSPs branching out beyond managed endpoints and networks in response. 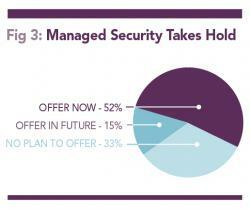 Already, 52 percent of channel pros offer managed security, a little over half offer subscription-priced VoIP or unified communications services, and about 33 percent provide disaster recovery as a service. Furthermore, 37 percent of participants in our poll expect margins on managed security to grow this year, and 26 percent say the same about VoIP and DRaaS. That’s not the only growth channel pros are anticipating, according to our data. 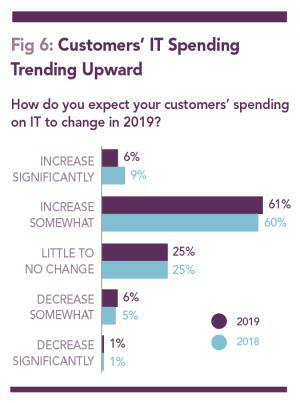 About 67 percent of them forecast higher IT spending overall by their clients in 2019. In addition, 58 percent expect that trend to translate into higher revenue, 57 percent believe they’ll collect higher profits, and 41 percent project an increase in their personal income. Our readers see good things ahead for everyone, in fact. About 53 percent of them foresee somewhat or much better market conditions this year for the economy as a whole, and 60 percent predict better conditions for the channel in aggregate. Those figures are down from roughly 58 percent and 67 percent, respectively, in our last State of the Channel poll, but remain solidly optimistic. This year’s upbeat projections come on the heels of what appears to have been a lucrative 2018 for many channel pros, including Dale Cooper, president and CEO of Xact Communications, a provider of IT and telecom services based in Lexington, Ky. “Business was good,” he says, noting that the company’s top line grew 25 percent last year. Cooper’s no exception either. 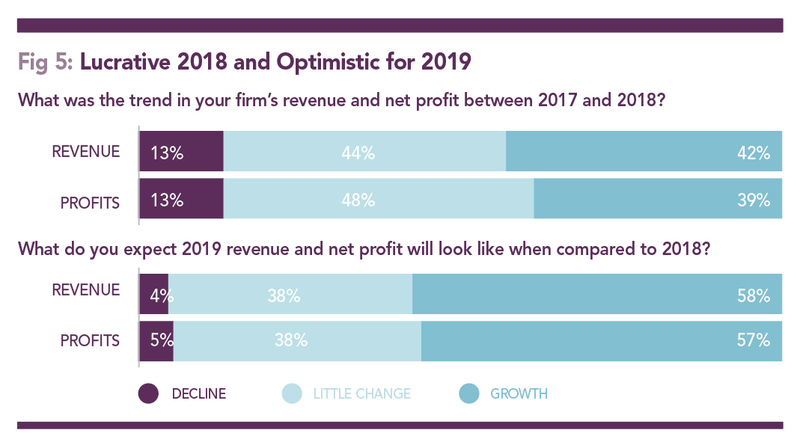 Just over 42 percent of survey participants saw revenue climb in 2018 and about 39 percent recorded higher profits. Many of the same people making more money, however, are spending more too, specifically on people. U.S. unemployment rates for IT occupations are barely above zero at present, and that low supply of talent coupled with high demand is driving salaries up. That means the roughly 48 percent of survey respondents who plan to add employees in 2019, not to mention the additional 48 percent forecasting flat headcount, have more generous job offers and fatter paychecks in their future. Indeed, 43 percent of readers expect to pay their technicians more this year (versus 35 percent in 2018), 39 percent expect to pay their salespeople more (versus 32 percent a year ago), and 28 percent expect to pay their office staff more (versus 26 percent). Cooper, who has hired four people in the last three months alone, is among the many channel pros resigned to the inevitability of higher labor costs. “It’s harder to find the people you want,” he observes, adding that paying more to attract and retain them is the inescapable corollary. 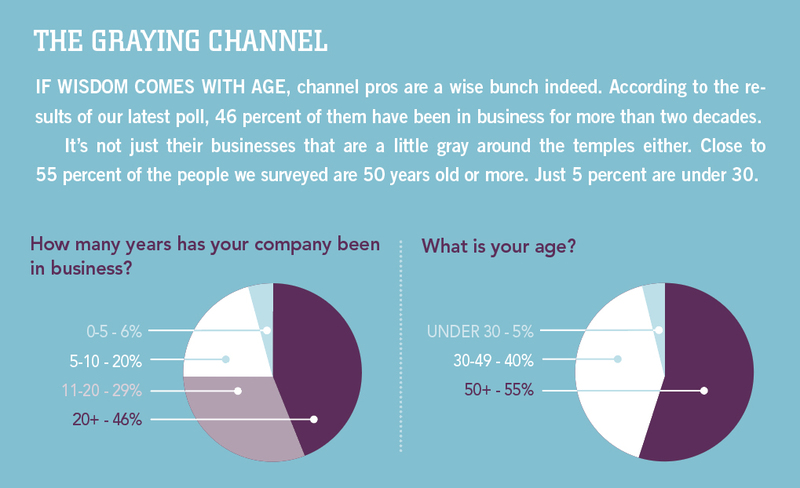 The 2019 ChannelPro State of the Channel survey was conducted online from August to October 2018 and was open to everyone in our email database. About 43 percent of the 846 respondents call themselves MSPs, 37 percent say they’re primarily VARs, and 19 percent are custom system builders. Among our respondents, 49 percent hold executive management titles such as CEO, owner, and president; 19 percent work in unspecified technical management roles; and 20 percent are sales or marketing managers. Approximately 30 percent work at companies with one to four employees, while roughly 19 percent, 27 percent, and 24 percent, respectively, are affiliated with firms that have five to nine, 10 to 49, and 50-plus people on staff. *Note: Percentages are rounded to the nearest whole number. One way channel pros appear to be offsetting overhead increases is adding new services, including those that IT providers haven’t traditionally emphasized. Among respondents, 40 percent offer video surveillance systems, for example, and another 16 percent plan to in the future. Similarly, 34 percent offer access control systems and 23 percent provide alarm systems, with another 15 percent in both categories planning to join them in the future. The accelerating convergence of formerly separate channels is a factor too. With voice and print providers increasingly adding managed IT services, more and more channel pros are responding in kind. Some 49 percent of readers we polled have a telco offering already, for example, and another 14 percent plan to add one. A more modest 29 percent deliver printer or managed print services, and 13 percent expect to enter that market in time. Not surprisingly, substantially larger portions of our readership have a cloud computing practice. In fact, about 55 percent offer cloud consulting and deployment services at present, and another 22 percent say they will in the future. Moreover, 52 percent of poll respondents sell Office 365 licensing right now and 42 percent provide email hosting. Few of those channel pros are making lots of money in the cloud, however. In fact, 43 percent of participants in our survey make less than 10 percent of their revenue from cloud offerings, and fully 78 percent make less than 25 percent. Though 57 percent foresee cloud services accounting for a greater share of revenue this year, 39 percent predict no change. Channel pros aren’t exactly enthusiastic about cloud margins either. About 42 percent of those we polled called margins on cloud consulting average, though 37 percent expect that to improve this year. Approximately 36 percent, meanwhile, labeled margins on Office 365 downright low, and 40 percent don’t see that getting better in 2019. Yet there’s plenty of upside potential in the cloud for IT providers willing to grab it. For example, just 25 and 32 percent of survey participants, respectively, include platform as a service and infrastructure as a service among their offerings today. And even smaller numbers play in higher-margin cloud segments like cloud application development (20 percent), cloud CRM solutions (17 percent), and online ERP services (11 percent). Comparably low percentages plan to enter those markets in the future, too. Those aren’t the only margin opportunities many channel pros are missing out on. For instance, though global spending on big data and analytics will grow at a nearly 12 percent CAGR through 2022 to $260 billion, according to IDC, just 18 percent of channel pros deliver services in those areas currently and just 23 percent more plan to do so. The outlook for another large and rapidly growing technology segment—the Internet of Things—is brighter among our readers, however. Worldwide outlays on IoT solutions and services will jump 15 percent this year to some $745 billion, says IDC, which expects that figure to top $1 trillion by 2022. Eager to cash in on that opportunity, fully 30 percent of participants in our latest poll earn at least some revenue from the Internet of Things now, and 35 percent of them say they’ll eventually do the same. The security market, on the other hand, is a big opportunity today. Close to 66 percent of respondents to our poll provide anti-virus, spam filtering, or network cybersecurity services at present, and 12 percent more say they will in the future. Though 48 percent of people we surveyed call margins on security offerings average, a robust 35 percent expect security profits to rise in 2019. Though the need for security assistance may be getting bigger, concern about security risks has actually gotten smaller in the last year. When asked to rate their concern about security threats on a 1 to 10 scale, with 10 being highest, precisely half of this year’s poll respondents answered 9 or 10. That’s significantly down from 64 percent in our 2018 study. We know how they feel. We like asking questions here at ChannelPro too. If you share our passion for number crunching, you’ll find additional answers and insights about the State of the Channel on our website. This article was originally published at ChannelPro Network on 03/20/2019. It was added to IoTplaybook or last modified on 03/20/2019.